The Florida Fish and Wildlife Conservation Commission (FWC) is unveiling a new lionfish smart device app during a live Twitter chat from 2 to 3 p.m. EDT Wednesday, May 28, and everyone is invited. To participate, sign in to Twitter and follow @MyFWClife or #FWCLionfish. Make sure your Tweets have the #FWCLionfish in them so we can see them. The chat will begin with a short video, followed by fun facts and a chance to ask questions about lionfish and the new app. Participants can also try their hand at one of our trivia questions for a chance to win a newly redesigned “Lionfish Control Team” T-shirt. These aren’t your typical T-shirts; using the free app Aurasma, the logo on the back comes to life. Be sure to participate to find out how else to receive a shirt. 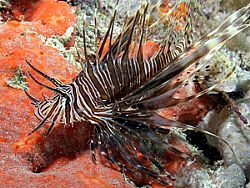 Lionfish are an invasive species that have great potential to negatively impact Florida’s reefs and wildlife. These fish not only prey on native species, they also compete for food with economically important species such as grouper and snapper, and they can disrupt the balance of native populations, ultimately causing a cascade effect that can alter habitats.